Hifumi sent Shiku, who clung to his waist, flying with a kick. Without a single glance at Shiku who’s rolling on the ground, Hifumi who held the kusarigama, began to advance again. His stride is slow but powerful releasing a pressure of it being unstoppable by anyone. At the same time as the voice resounded, stones, wind blades and even compressed water currents are aimed at Hifumi. Hifumi avoids the spells, which come flying, as if performing a light dance. The elves can’t conceal their irritation due to Hifumi moving left and right and brandishing his kusarigama while being surrounded by 10 of them in a semicircle. What Hifumi threw wasn’t the counterweight but the sickle part. The sickle deeply pierces into the nape of an elf’s neck getting only stopped by the collarbone. The elf, who widely opened his eyes in shock, without time to pull it out, was dragged towards Hifumi. While pulling out the sickle with a light yell of encouragement, he tears the neck. The elf whose limbs were flapping about, dies having his entire body shredded by wind magic while getting used as shield. Hifumi threw the body, which lost its strength, at another elf. Next, spells with arrows mixed in-between come flying at Hifumi who plunges towards the clamouring elves. Hifumi who was directly assaulted by spells and arrows being hammered out without a single break, is naturally unable to dodge all of them. The cuts on his cheeks and arms are slowly increasing. Closing in upon a single elf as if sliding upon scattered sand with a *thud*, he drives his fist which tightly grasped the counterweight, into the elf’s face with all his power. Throwing the grasped counterweight over his shoulders, he crushed the face of another elf as well. Wiping his cheek with a finger, he feels hot blood wetting his fingertip. Storing away the kusarigama, Hifumi draws the katana at his waist. The light of the sun slightly peeked through the gaps between the trees and faintly shone onto the katana. Due to Hifumi laughing while dyeing the elbows of both his arms with the blood of the elves and himself, the elves shuddered to the degree of even forgetting to release their spells. Hifumi turned the point of his katana towards the remaining elves. 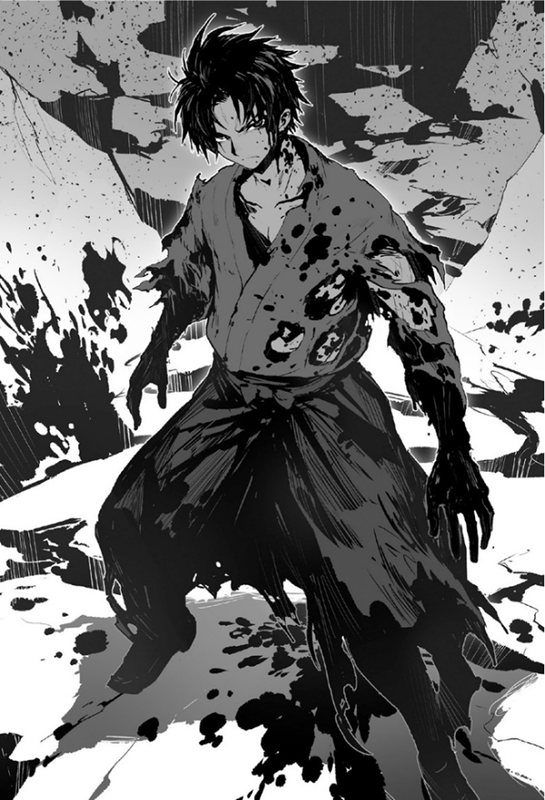 While enjoying the tingling feeling originating from the pain of his wounds, he takes a stance with the katana being carried on his left shoulder. There are 7 elves remaining. An elf who concluded that it was plenty to overwhelm him, shouted. Once again a volley of spells is fired. Even for Hifumi it’s impossible to avoid all the fast bullets which are invoked far quicker than any spell used by humans, and thus he gives up on that. Lowering his stance, Hifumi who moves forward as if sliding, doesn’t decrease his speed even while getting struck in the stomach by stones and cut at the shoulders. Using the momentum of running through, he bisects the elf who gave directions, with a slash diagonally from the shoulder. With a short scream the elf’s body split in two parts and dropped to the ground. He’s already covered in wounds all over, but his expression is cheerful. Hifumi pouted due to the words muttered by someone. Hifumi who took a stance of holding the pommel against the left side of his hips, approaches the next elf in one bound and kills them with the force of a thrust similar to shooting it out. Pulling out the katana, he closed in on another elf while receiving a barrage of countless pebbles, made with Earth magic, with his back and chopped off the elf’s head while turning around. Swinging the katana, he clears away the blood on it. What one of the elves released was a fire arrow. Hifumi perceived the other eves’ surprise in a corner of his sight. Being people who live within the forest, they mostly don’t use fire magic, or rather, they probably can’t use it. He deliberately evades the fire arrow at the last second. The scorching heat of the arrow chars his right side and the dougi turns black. The katana which Hifumi thrust out, pierces the chest of the elf and its point stabs through the elf’s back. The elf’s hoarse voice is blended with blood. The katana slides out at the moment the elf collapsed. The blood, which is dripping from the point, falls to the ground. His murmur is small. However, all of their ear’s have surely heard it as death sentence. Before the attack on Hifumi there was movement at the house of the leader Zanga. The one who came entering with a brief comment as warning for form’s sake before dawn was a man called Laboras (T/N: >> Raborasu <<) who unifies the men of the village. He was quite different from the image of an elf. With a tall and muscled body build, he was a giant who’s good at handling knives, however, contrary to his appearance, he was also good at using magic. Laboras who sat down opposite of Zanga with the sunken hearth between them with an air of familiarity, emitted a dangerous aura from his entire body. Zanga throws a twig into the sunken hearth as the fire grew weak. Laboras’ voice gradually becomes lower. Laboras put strength into his fingers, which are grabbing his own knees. Laboras, who paused, raised his right hand and two male elves who seized Puuse’s both arms, came entering from outside. Puuse was apparently hit badly a dozen times, her left cheek was swollen and large drops of tears ran down from both her eyes. Seizing both her arms is in order to make sure that she doesn’t heal herself with magic. Once released by the hands of the men, Puuse walked unsteadily and crumbled down on her knees next to Zanga. As Zanga wondered what she was apologizing about, Laboras raised his voice which was blurred by his rage. Hearing the situation from Shiku who woke up, Laboras investigated close to the barrier on the wastelands’ side. There he discovered the corpses of his brethren who were devoured by wild animals. Laboras opened his eyes widely and glared at Zanga. Beating Puuse who didn’t reveal the matter in question out of fright, Laboras forcibly extracted the information out of her. Laboras removed his gaze from Zanga who pursed her mouth, and glared at Puuse who has broken down crying. While placing her right hand on Puuse’s back, Zanga lined up words in Puuse’s defense. However, Laboras was unable to agree to either of them. As Laboras’ words revealed his confidence, Zanga answered with a sarcastic smile. For a short while the room was wrapped in silence, however Laboras suddenly stood up. Leaving he two men who brought Puuse, behind as guards, Laboras went away. She grabs one sheet of cloth off the pile nearby and gently wipes Puuse’s face. “I’m really sorry”, Zanga gently brushed Puuse with her still movable right hand. Shiku, who pricked up his ears in front of Zanga’s house, learned of Puuse being banished and ran in panic to Hifumi’s place to request his assistance. It was himself who told Laboras the truth, but by no means did his thinking reach the conclusion of even Puuse having to take the blame. Even if he talks to someone from the village, they likely won’t forgive Puuse, once Laboras tells them that she broke the law. If it’s a human who possesses that much strength, he might be able to rescue Puuse and take her to somewhere safe, he judged. He was scared of meeting that dreadful human. He wasn’t able to suppress the trembling of his knees as he recalled Hifumi’s smile at the time he killed Shiku’s brethren, however no other good idea came to his mind. He doesn’t believe that he can win against the men who remained as guards, if it’s only himself. And, Shiku who sought his assistance, and the assassins who were sent by Laboras, arrived at the hut where Hifumi is staying in, at the same time. And now, Shiku who once again ended up fainting, came to his senses at last. In the visual field, he saw in his absent-minded state, heaven and earth were upside down. As the current situation was inverted, he apparently fainted being hit by a trunk of a tree. Twisting his body in a squirming motion, Shiku who finally returned to a sitting posture, recalled the situation before he lost his consciousness. In front of his eyes there’s the completely broken hut. On the opposite of that there are several corpses being scattered about. Shiku who ended up looking directly at something sticking out from a corpse, which had its body cut in two, threw up until his stomach became empty. Pulling himself together, he searched for the figure of Hifumi in order to not look at the corpse, but he saw the back of someone doing something while crouching down while being in fact surrounded by those corpses. The strange attire which had a beautiful deep blue colour, was riddled with holes all over and was dyed by some deep red stains. Resolving himself and getting close, Shiku notices that Hifumi is holding an arm of someone and his white face becomes blue. Hifumi who cut a corpse’s finger into two, thrust his finger in front of Shiku after running it across the cross-section. A white sticky something is clinging to Hifumi’s fingertip. Hifumi built a hypothesis upon the autopsies up until this point, but he believed in it with almost no doubt. As result of transforming from the tips of the limbs and having the head encroached last, the body changes while the senses are still clear. It’s a viciousness as if it is for the sake of causing complete dread. Shiku who dropped his shoulders as it was 180° different from the custom which formed a belief that it was a nice thing, finally remembered Puuse’s and Zanga’s situation. Hifumi who scrubbed both his hands which touched the corpses with a paper, grabbed a corpse which lost both hands and feet, and tossed it into the broken house. Hifumi easily refused Shiku’s teary request. Heh heh nah don’t really care. So good thank ou for the chapter and all the hard work. I love Hifumi’s “For Science!” outlook. What a battle maniac. And I’m waiting for the grotesque death of that muscle head elf. “It’s not like I’m solving the mystery of your decease to help you. Don’t misunderstand, baka.”. Hifumi is such a tsundere. These elves are the most retarded creatures in this world so far. Nothing will be lost even if they go extinct. Even that bear dude from the previous arc had some sort of reason for his behavior. they do have a reason but its based on a blind idealism of them joining the trees being painless natural and the forest being some kind of holey barrel ground for them because it is made up of trees that their family joined with they even think on some level their dead loved one live on as part of the forest. but the truth is its all a nice story they tell themselves all wile they are slowly eaten alive by the forest. Thanks for the chapter, easely one of the best figths that Hifumi has had so far. His badass as he can be! !